What is this binder project? Each month 3 people will be selected at random from the list of entries. The recipients will receive a brand new GC2B binder. GC2B has generously offered to support this project. They are donating 2 binders each month for my giveaway. I will still be providing 1 binder out of pocket. Please show them support and check out their page which is linked below. Why are binders so important? For those of us who suffer or have suffered from dysphoria, binders assist with helping to align us with our gender presentation. 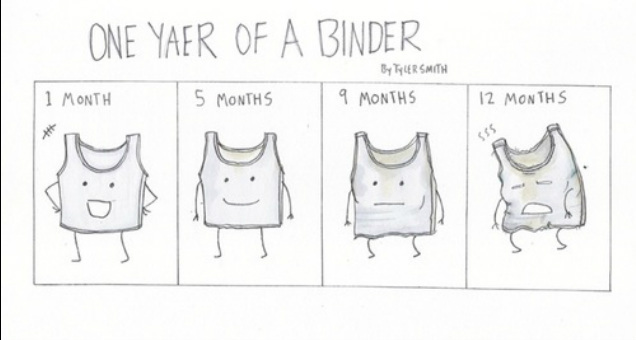 Although for some this may be a stepping stone to top surgery, others may use a binder for a longer period of time. The one thing I ask is that people only apply if they identify with being transgender/genderqueer, and not for performance purposes (ie: drag king, acting, performances) and save the binders for folks who need it and maybe suffering from dysphoria.